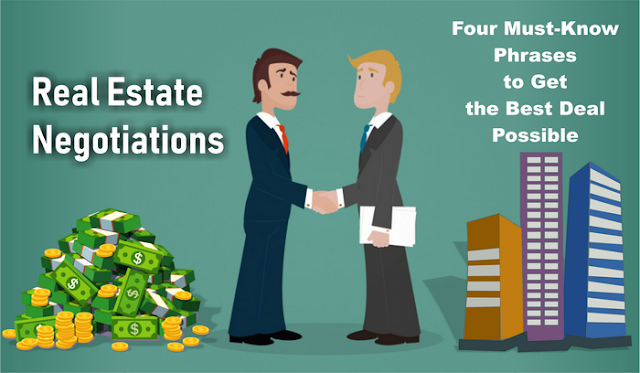 One of the most important skills you must master if you want to be successful in real estate investing is negotiating. This skill is useful in a variety of contexts within the real estate arena - dealing with sellers, dealing with buyers, dealing with closing agents, dealing with lenders, etc. - but the focus of this article will be on negotiating with homeowners. For our purposes, we shall assume these are private sellers rather than corporations or banks. The key point I want to stress here is that timely use of select words and phrases can make you thousands of dollars. From my experience, I have found the most effective, and ethical, use of negotiating with sellers occurs right up front, the first time you discuss price. I'm going to present you with some phrases that have helped me seriously pad my bank account over the years. Rule #1 - he who names the first number loses. You always want to try to get the seller to tell you how much he wants for the property before you ever present him with an offer. Think about it: if a seller is willing to take $50,000 for a property, and you come in and offer him $60,000, you've just cost yourself at least an easy $10,000, and probably more. Not all sellers will divulge their asking price to you upfront. One of the ways to counteract this is to ask the seller what he thinks the property is worth, given its existing condition. Once you have a number from the seller, you can go to work to negotiate that number lower. A favorite phrase of mine is, "If I paid you all cash and closed quick, what's the least you'd take?" Most sellers understand the power of cash and why it's preferable to an offer from a buyer that needs to get a loan to buy their property. Another particularly effective phrase you can use is, "Is that the best you can do?" Make sure to ALWAYS ask this question. Frequently, a seller will lower their asking price in response to this question. Finally, you can use this phrase in a final attempt to get a lower number from the seller: "So you're saying that if I can't pay you $x (whatever their most recent asking price is), we can't do business?" You'll be amazed how far downward many sellers will come from their original asking price when you ask them a series of questions like this. "What are you willing to sell the property for, given its existing condition?" "If I paid you all cash and closed *quick, what's the least you would take?" "So, you're saying that if I can't pay you $x (their most recent number), we can't do business?" Of course, just because we've gotten the seller to seriously discount their property from the original asking price doesn't mean we're finished. When we do put together an offer, it will probably be for less than what they're asking for, but this sequence of questions is designed to make the seller more comfortable with selling their property at a steep discount. If the seller is responding to your questions, in their mind, it is now their idea to sell the property for less. This makes your job much easier than if you had just gotten one asking price from the seller and subsequently submitted a lowball offer, which pales in comparison.